Our boys are Lego OBSESSED. So, it was no surprise to me when my middle child turned four last year, that he requested a Lego birthday party; much like his older brother’s party which I posted about HERE. 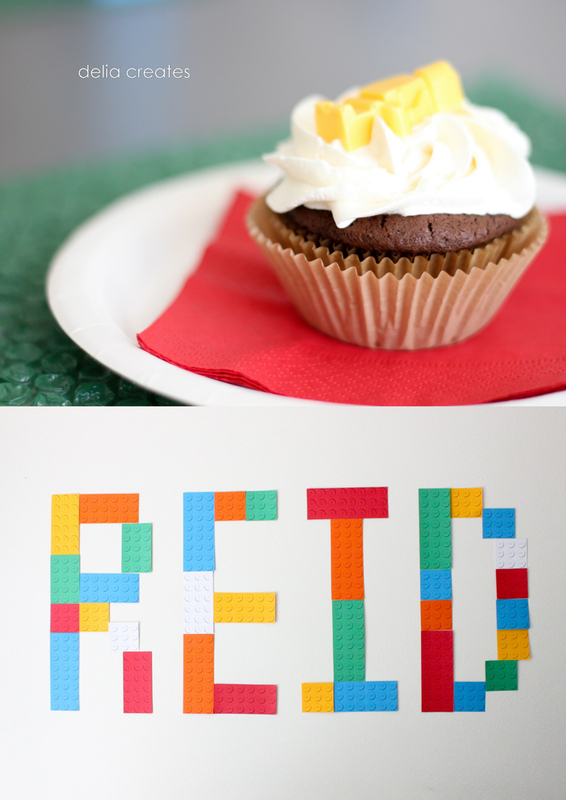 I, of course, relied on the printables I created for our first Lego birthday party. 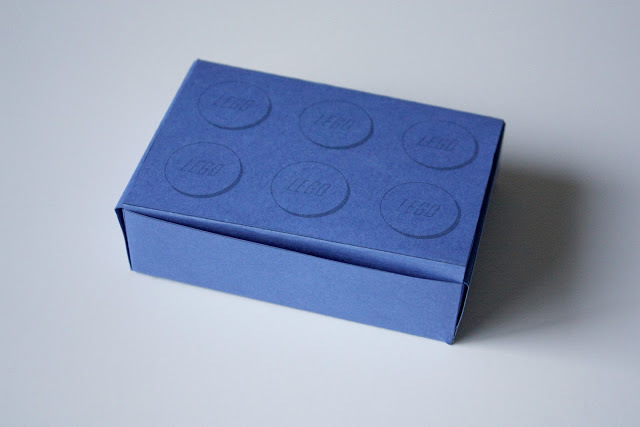 The Lego brick favor boxes free printable – found HERE. 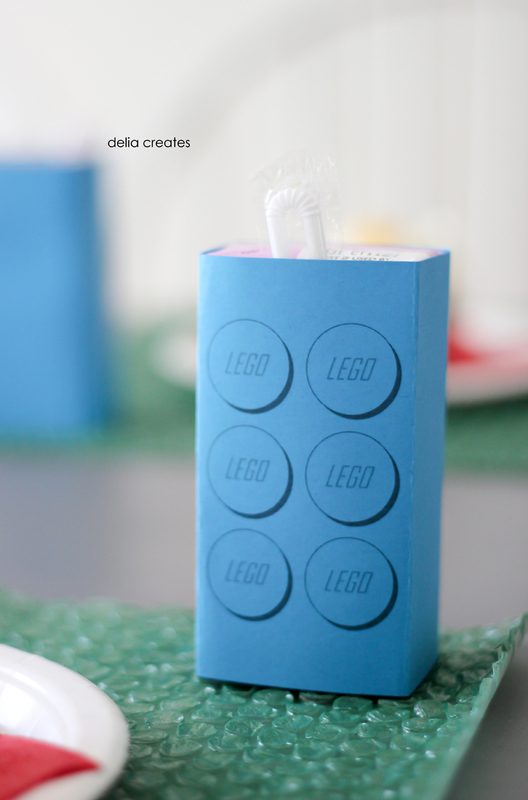 The Lego brick juice box wraps, found HERE. Oh and I cut the Lego base runner from the last party into square Lego base placemnats. (It’s just bubble wrap spray painted green). 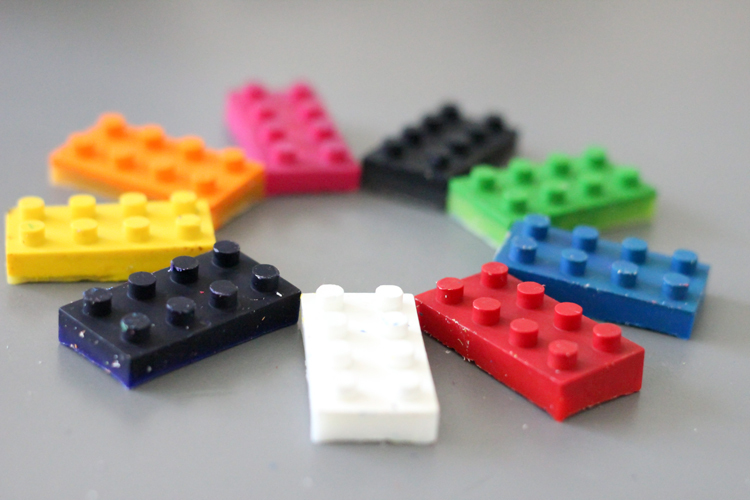 We used the blue mold to make little candy melt Lego men first and then made some crayon versions afterward. My kids loved helping with the process. We simply soaked the crayons, took the paper off, broke the crayons into bits and baked them at 250 degrees for about 15 minutes. We found that the cheaper RoseArt crayons were much easier to peel the paper off of, but those crayons also didn’t melt as evenly as the Crayola brand. If you want single colored molded crayons, I recommend using brand new crayons to ensure you get a nice clean look. Used ones often have flecks of other colors on them (as you can see). 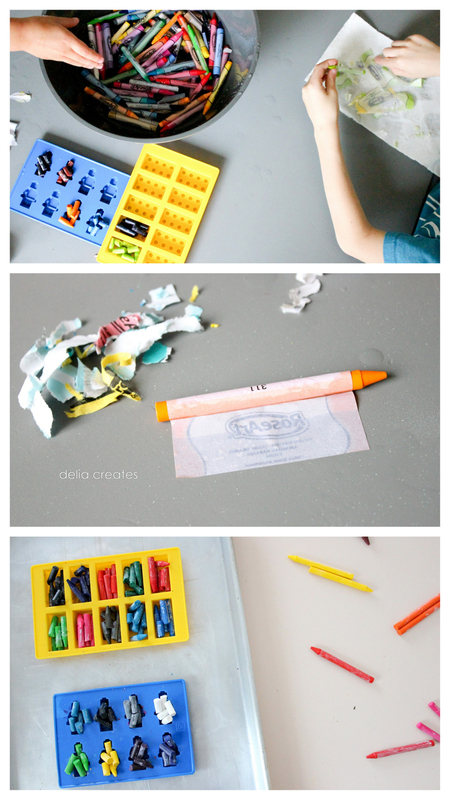 Keep in mind that the crayons also will stain the molds. After a good hot wash (or two!) in the dishwasher they are good to go and still good for many more uses, but will probably still be stained, mostly from any reddish crayons. Whether you want to use them for candy again…I will leave up to you. 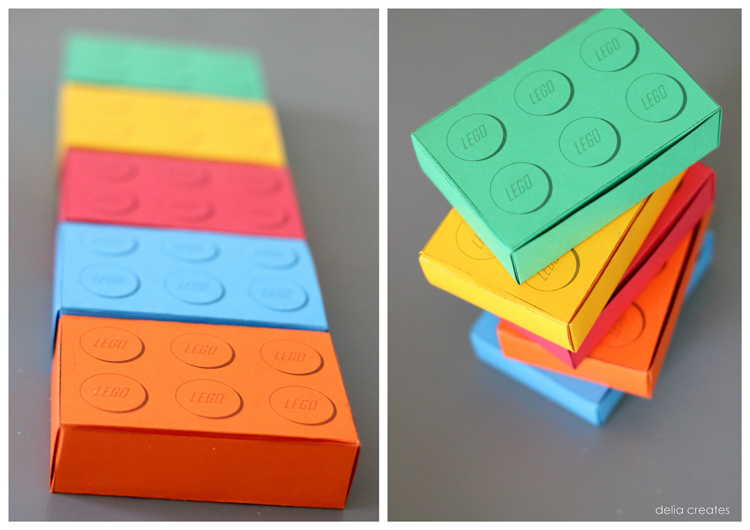 For our favors, we boxed up our Lego crayons and then covered little mini composition notebooks with some Lego bump photo paper. I took a picture of a Lego base, got it printed on glossy, regular weight paper, cut it into strips the same width as the books, and then wrapped and glue them to the outer cover of the books. The books didn’t fit into the favor boxes like I had hoped, so we stacked them together. 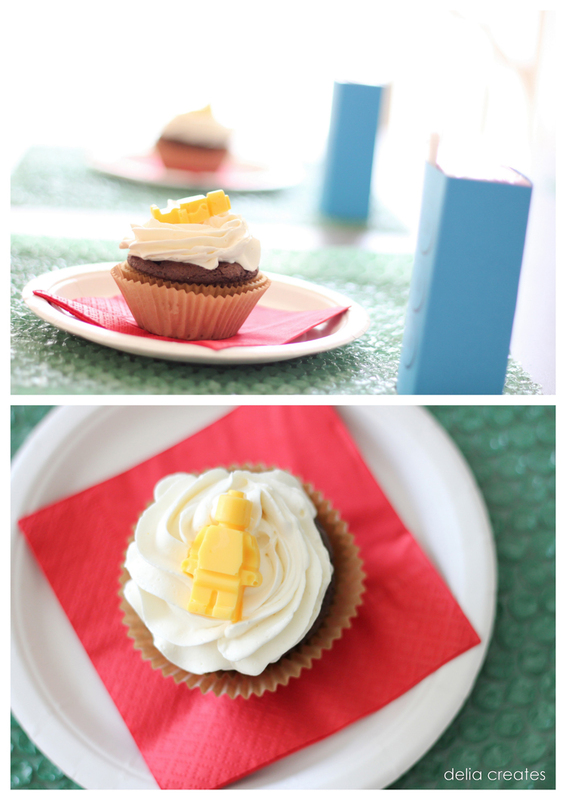 For the food, it was a mid-afternoon party with just three of his friends, so we kept it to juice boxes and cupcakes. 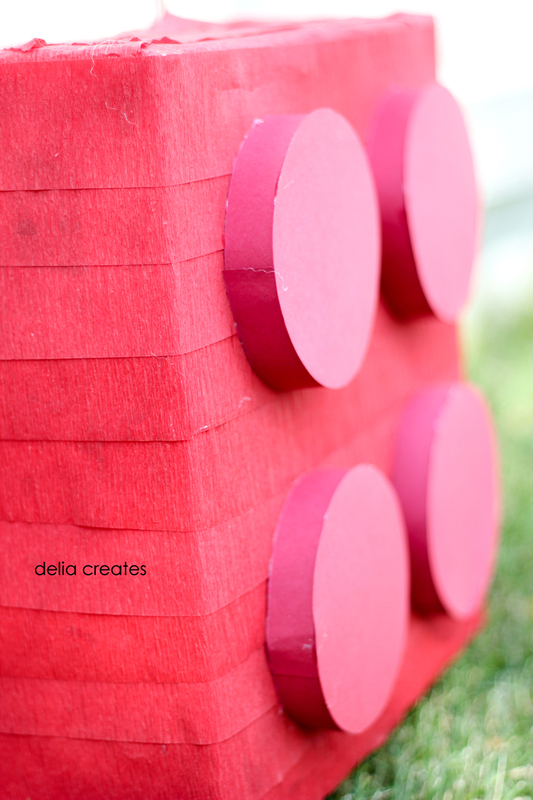 I printed up my Lego bumps printable in a bunch of different colors (found HERE), cut down the cardstock sheets into bricks, and built his name out of paper Legos. 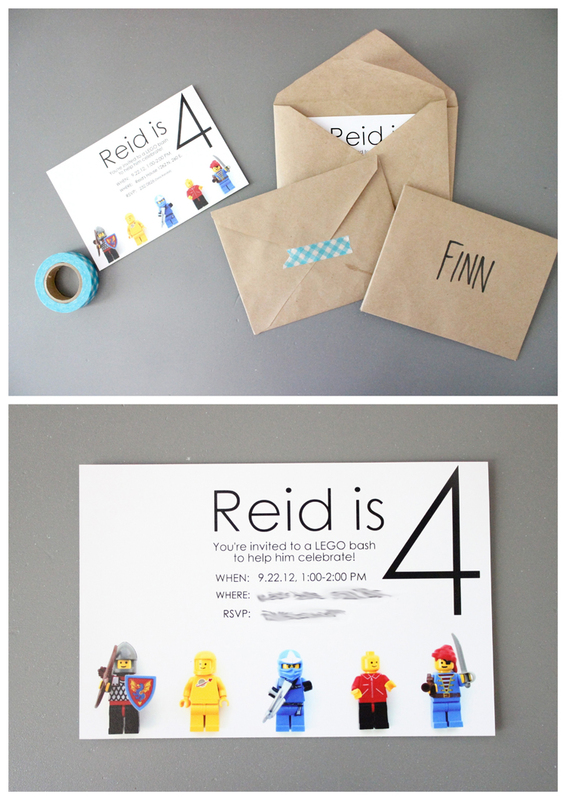 For the invitations, I photographed some of his Lego guys, added text, and then printed these up on on glossy card stock cut down to 4×6 inches. Really simple. 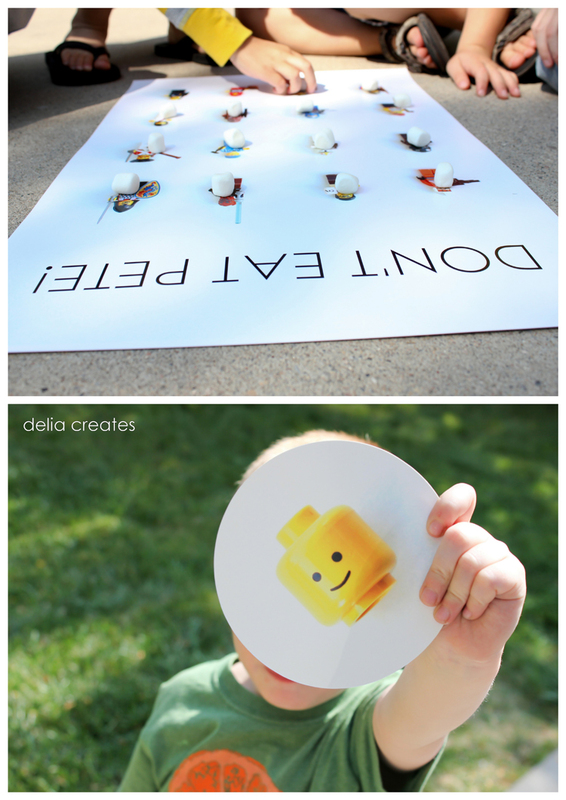 Don’t Eat Pete is a classic kids party game and a favorite of my kids, so I had to include a Lego version. CLICK HERE to download a free copy of the game board. If you don’t know how to play, you take a game board of images, cover them up with candy or some kind of small treat. Have one person be “it”and leave the room. The rest of the group still in the room decides which image is Pete. The person who is “it” returns and eats the treats one by one until he gets to “Pete.” When he does, everyone shouts (or screams maniacally :)) “Don’t eat Pete!! !” The person who is “it” has to stop eating the treats. Reload the game board, choose a new person to be “it” and then repeat the process. 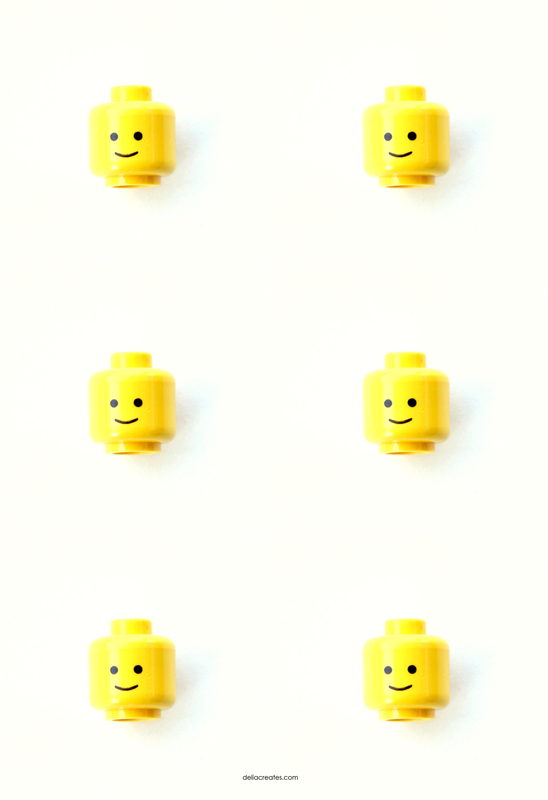 We played I Spy the Lego Guy (as we did at the first party), but with these little Lego guy heads I photographed. We also used these Lego heads for pin the head on the Lego guy. To the end the party we of course had to have a pinata! I made one similar to the one from the first party, but with four bumps instead of six, since he was turning four. I also made it a hit pinata rather than the pull kind, since the weather was nice. 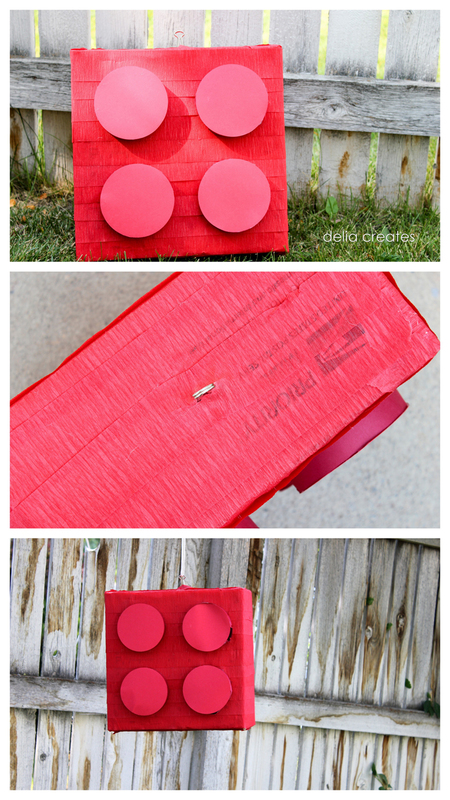 I took a square priority mail box, covered it in crepe paper, and added bumps using circles and strips of red cardstock instead of cans. The cans were fine for the pull pinata but presented a safety hazard for the hit pinata. I also mostly hot glued everything together rather than mod podging it. It made things go faster and created a cleaner look on the outside. I used a binder clip to stick through the top to hang it from, and then crepe-papered the opening shut where I added the candy. 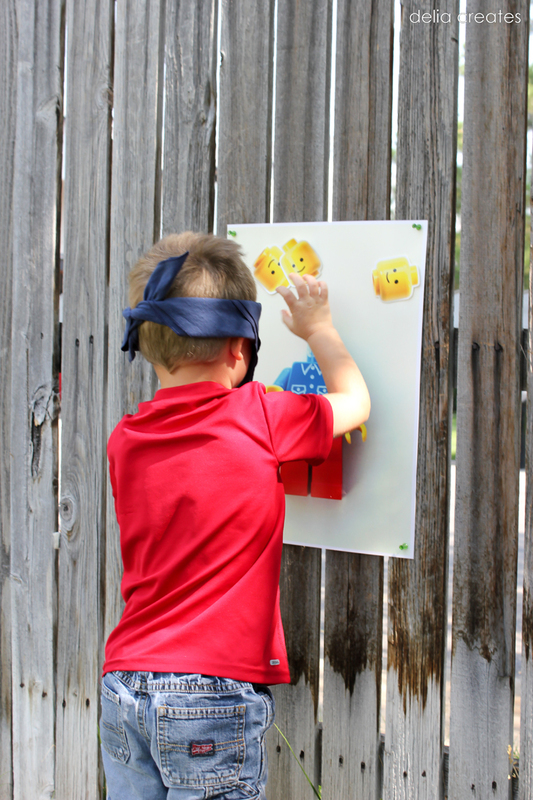 I should have also beaten the box up a little before papering it, because it took all the kids several turns, eventually without their blind folds and then a good hit from good ole dad. After the pinata rush, and the sugar rush, the kids played with of course…Legos, until parent pick up. It was a perfectly simple, fourth birthday party. Not too much work for me, but plenty of never bored fun for the kids. Alright, and now for the good stuff! Simply right click on the images and save them to your computer. All files are sized to close to 11×16 inches, except for the invitation and thank you card images which are sized to 4×6 inches. +You can print them at home, but I highly recommend printing them at a local print shop like Kinkos. +The images that are sized 11×16 will print best on 11×17 paper or 13×20 paper and will have a white (likely an almost non-visible) border. I recommend glossy cardstock. Always ask to see a digital proof from your printer to ensure it looks how you want it. +You can print the 4×6 inch images as photos. Add text to the images using the photo machines at the store or using a free program like Picasa. +Printing any of the images larger than they are sized for, will produce blurry and or pixelated images. Delia, this is AWESOME!!! I love all the things you made for the party. But, my jaw is still hanging over those crayon molds. Who knew! 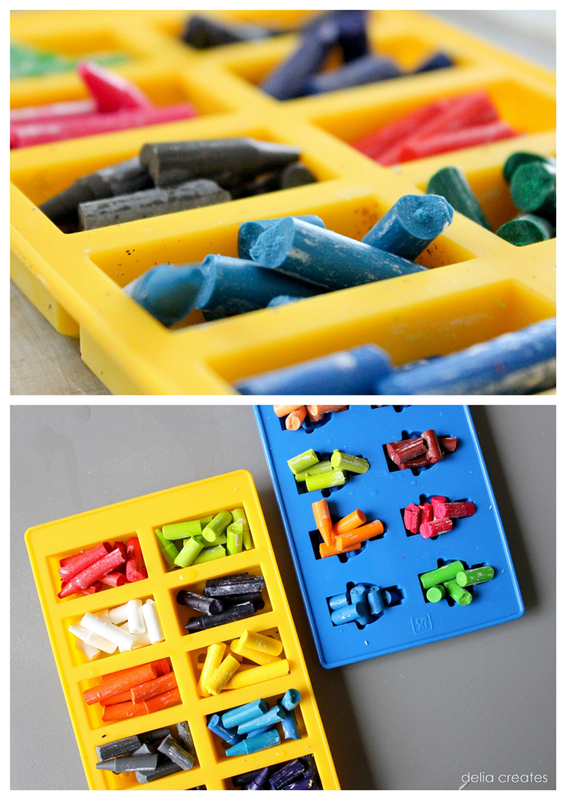 Where do I find the crayon molds? Thank you! Such a great party! 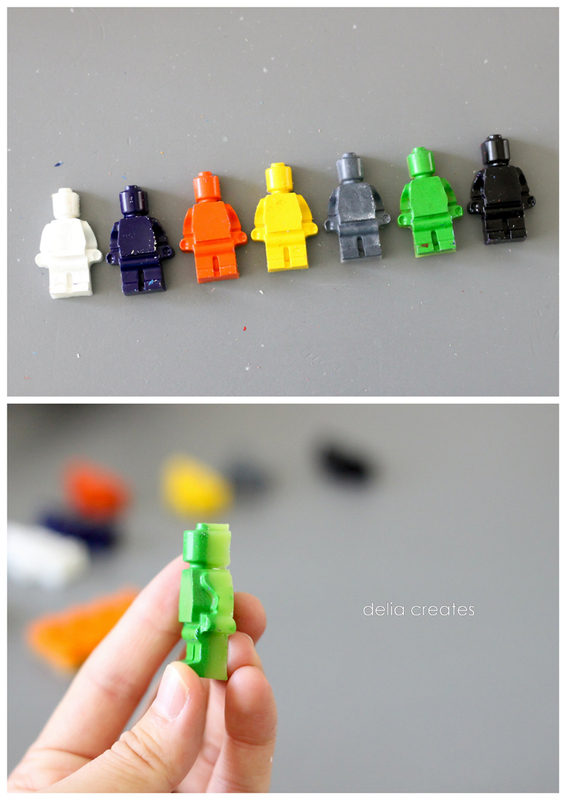 I love the little lego men in their candy, crayon and photo forms–brilliant! I LOVE THIS DELIA! Argh Lego Party! So fun!!! Delia, this Lego party is amazing! Loved that you included all the game ideas. And the graphics are so perfect- you are just so talented! for my daughter's second birthday I did cupcakes with chocolate minifigs on top. haha! Awesome DIY party. Very inventive use of Legos on the wall banner, treat-boxes, drink covers, but the pinata was truly and inspired idea! Plus Legos are so colorful and vibrants. Kids look like they had a blast. Great photos! 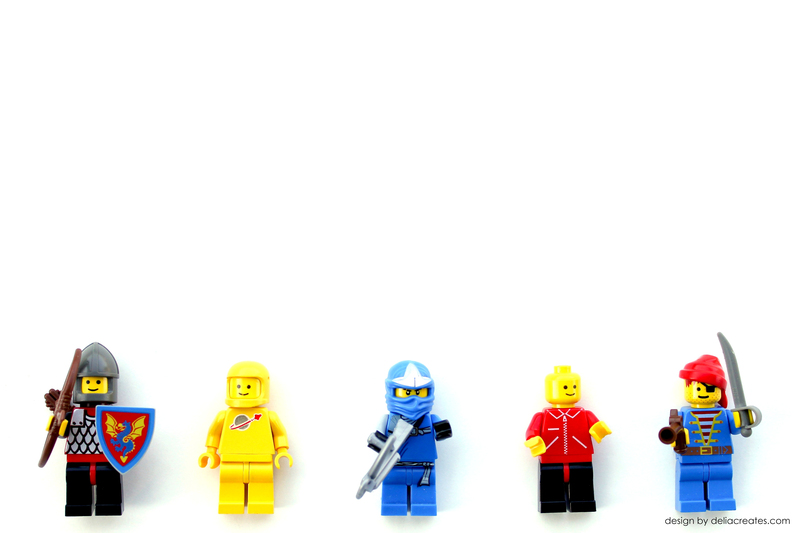 I had a LEGO party for my son & it was so much fun. Instead of treat bags we got a selection of the small boxed mini-kits. We had a carnival of sorts with different games at each station using LEGOs: at one there was a jar filled with LEGO bricks & paper for guests to write their guess for how many (closest won the jar). JUST NEED to say…you are MY HERO for putting this amazingness together!!!!!! I will surely be using your Lego parties as inspiration in a few years. My youngest just turned 2, but already obsessed with his Duplos and his teenage brother’s Legos! 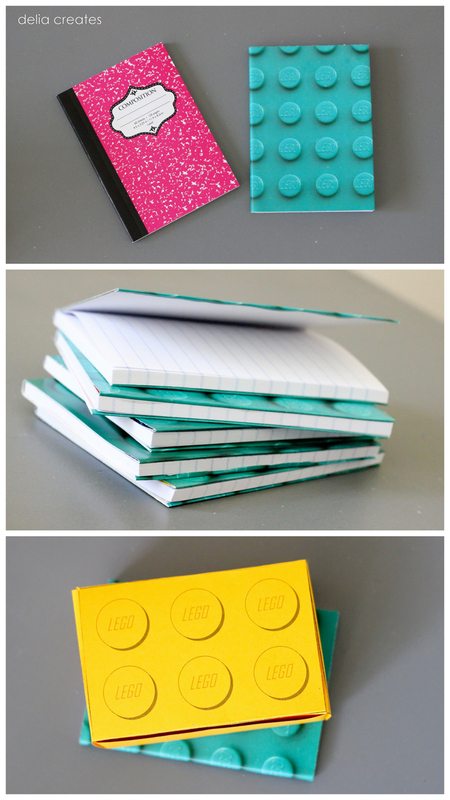 Where did you get the lego bump photo paper you covered the mini composition note books with? I love that idea for birthday ‘treats’ for my daughter’s class at school since we aren’t allowed to bring food. I love that your daughter likes Legos! Thank you so much for all of these wonderful printables and downloadables, it’s going to make my son’s birthday so much easier in a few weeks time! Thank you, Delia so much for sharing! I love all your wonderful ideas, and can’t wait to celebrate my son’s 6th birthday with them! 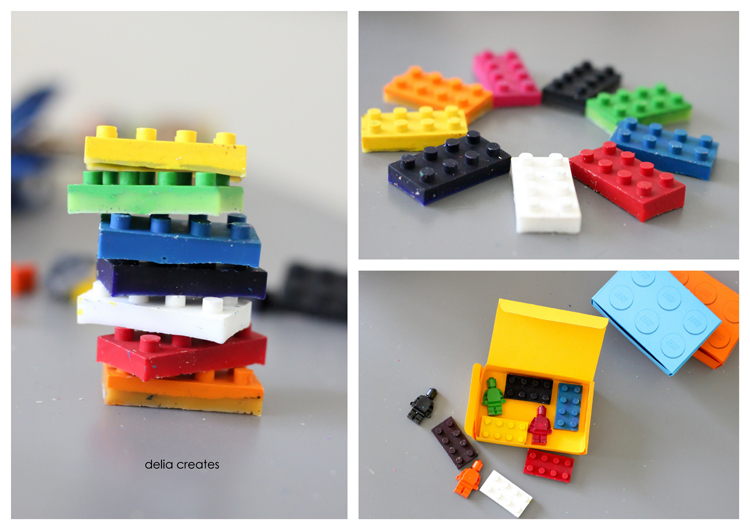 Hi Delia – Thanks so much for sharing these Lego resources! My son is having a Lego party this Friday and I have been using many of your ideas. I did try to print the 11×16 files but they came out pixellated at that size. Don’t know what I am doing wrong but I am going to try to figure it out before Friday! Thanks again for sharing all of your ideas and hard work Much appreciated! Oh no! Sorry about that. Did you save it to your computer first? If so, what dimensions does it say they are after you save it? I wonder if I need to upload the files again. Until then, email me at delia dot randalll at gmail dot com and I can send you the files by attachment. I love love this! My son is having a lego party in a couple weeks. I am trying to use your invitations but i am having the same problem. It says it is pixelated and i cant print it without it being blurry. Do you have any suggestions? Sorry about that Kyndall! I’m not sure why it’s coming out pixelated. If you want to email me: delia.randall@gmail and indicate which files you want, I can send them to you that way. Delia – I solved the mystery of the printables. It was the print shop, not your file. Thanks again for sharing your work with the rest of us! My party was a huge hit and my son, all of his friends, and his little brothers LOVED the Lego party. In fact, the parry is still going at our house, judging from the number of Lego-themed decorations that I have been asked to keep up! 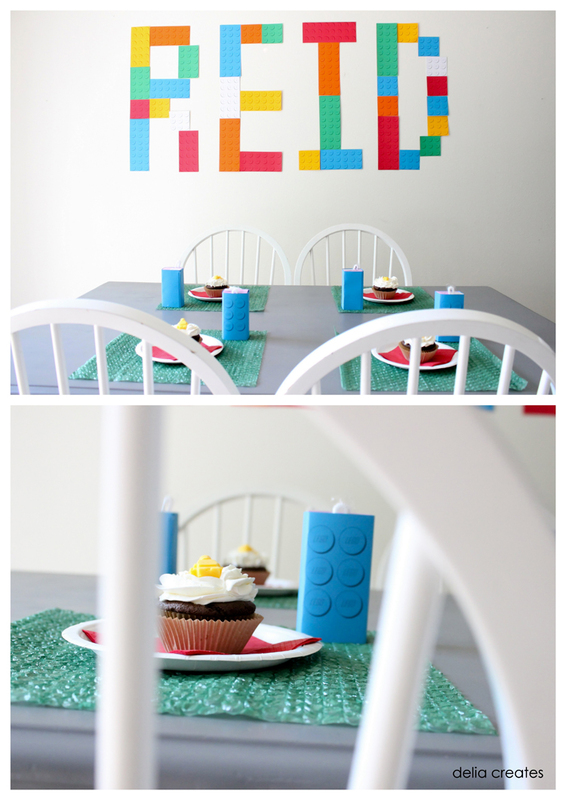 I just found your blog and the lego printables! So cute!!! Thanks so much for sharing them! These are definitely some of the best out there! I am right clicking and saving them, but when I open them up in Photoshop, they are very small, about 3″ and 72 dpi. I was wondering if you would be able to email me the files at full size & 300 dpi??? The ones I’m interested in are: the pin the head on the lego man, don’t eat pete, green lego bumps, and lego man thanks. Thanks so much in advance!!! I’m definitely a follower of your blog from now on! You rock!!! So sorry about that! I will send them to the listed address right now. Happy party planning! Thank you so much for making your printables available, you’ve just made my job a lot easier! I am having difficulty downloading the Lego Invitation and was wondering if you could send it to me. Sure! I’ll send an email shortly. Of course! Hugs to you too! Loved the party and decorations! I was just wondering where you got the brown envelopes for the invites? Thanks. I should have mentioned it. I made them. I just took an old envelope, opened it up completely, traced it on kraft paper and then folded and glued it together into an envelope. I hope that helps! Thank you so much for this. I made sure I bookmark this post for inspirations. My son is turning 6 next month!! I’ve been looking everywhere for the printable favor boxes, and thank you again for sharing!!! LOVE IT!!! I am so glad to help! Thanks Cee. Have fun party planning and happy birthday to your son! Hi! I am loving all your party ideas! So many great ones!! My sons party is this Friday and I just went to do the printables and they are coming up too small to print. Not sure what I am doing wrong! Is is possible to have the Don’t eat Pete, Lego Heads and Pin the Head Lego Guy sent to my email? I would really appreciate it! Sure! I just sent you an email. Sorry about the printing issues! 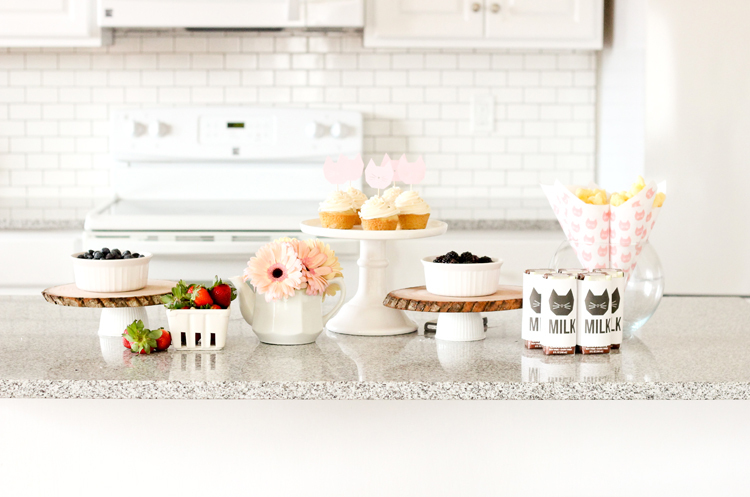 These ideas are so adorable! I would love to see a LEGO Friends party. Thanks! I love these ideas! Thank you so much! My son is having a lego party this Saturday and I am having some trouble with the image quality of the Don’t Eat Pete game. Is there any way you could e-mail it to me? I would really appreciate it! Sure! Just sent you an email. I did. I made the cupcake toppers first and then the crayons. I hope you found other parts of this post useful. Thanks for taking the time to comment Sue. Sure! I just sent it. Hi! 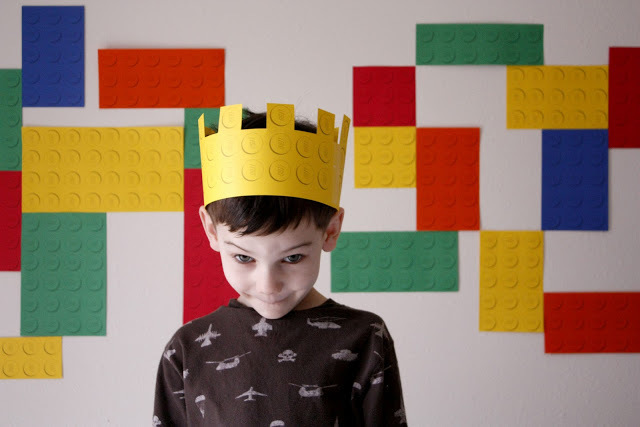 I love-love-love this post, as we are in the throws of Lego party plans! I’m also interested in printing many of the files seen, and wonder if they are coming out blurry for others? Would you be able to email everything (except Pete)? I would SO appreciate it! Sorry about that! Google docs must have compressed my files because they’re old? Not sure. I’ll send you an email now! Sure thing! I just sent you an email. Let me know if you don’t get it. Hi! What an awesome party!! I’m throwing my son a Lego party for his 5th birthday. Would you be able to email me the pin the head on the lego man files? I’m having the same blurry issues as the other commenters. I would be super grateful! Thanks so much in advance! Thanks! Of course. I’ll send them to this address: karinee259@aol.com now. 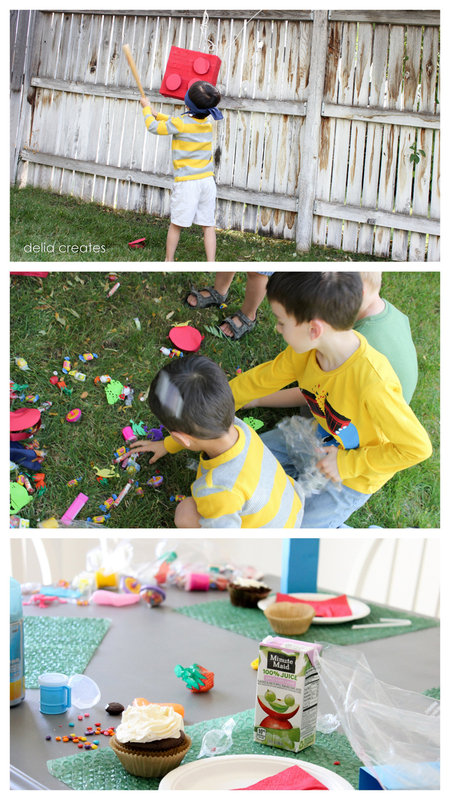 I love this lego party and you have given me some wonderful ideas as well as printables for my son’s 7th birthday coming up. Just wondering what size paper you printed the favour boxes on A4 or A3? I printed it on standard U.S. 8.5×11 inch paper. I believe that is the closest to A4 paper? I hope that helps! Let me know if you have any other questions. Happy party planning! Hi, I am planning a lego party for my soon-to-be 5 year old son. 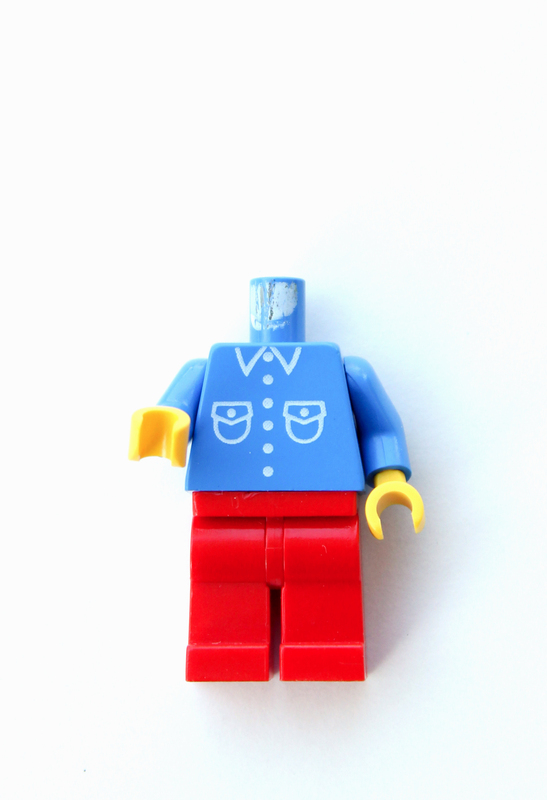 Would you mind emailing me your pin the head on the lego man printables? Do you have a printable to wrap around juice boxes too? Thanks in advance! These would be much appreciated! Of course! 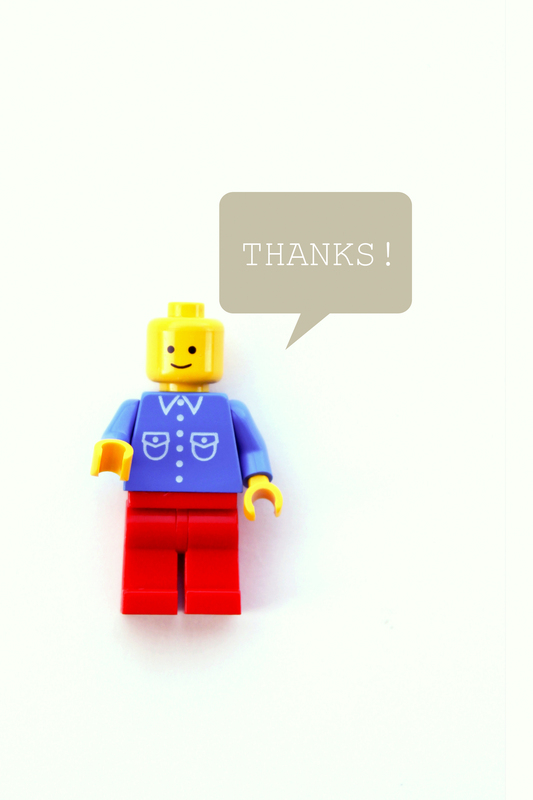 I just emailed both the Pin and the Head on the Lego guy files and the juice box files to you. Enjoy! Love this! Thanks so much for the ideas! I’m having trouble printing them as well. Would you mine emailing me the don’t eat pete, and pin the head on the lego man files? Thank you! My seven year old is so excited for his lego party! Sure thing! I just sent you an email. Happy party planning! Hello there! I’m having trouble printing this and not having it pixelated. Are you still emailing these files to people? I’d love the Don’t Eat Pete picture as well as the Pin the Head on the Lego Guy with heads. Thank you so, so much!!! Of course! I just sent them to you. Enjoy! Could you please email me the Don’t Eat Pete file? My son would like to play it at his party! Hi! Do you have a printable for the Don’t Eat Pete? I can’t see it on your website and would love it! Thanks! Yes! Just sent it over and added a link for download. Thanks for letting me know. I thought I had put it on here. Hope that helps! Do you remember what font you used for the invitation? Good question. It’s been quite some time but I believe I used Agency.